Dr Rikin Parekh has been in the Aesthetics industry now for close to 12 years. 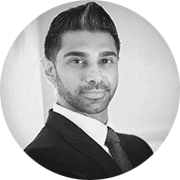 He is Medical Director of his clinic Avanti Aesthetics and his training academy, The Avanti Aesthetics Academy based on Harley Street London. He is a Key Opinion Leader and trainer for Sinclair, Galderma and Regenyal Laboratories. He is a member of the ZO Skin Health Faculty and is a trainer for ZO Skin Health. He has received extensive training with Dr Zein Obagi himself together with Rachel Eckel and is now able to pass on his vast knowledge to other medical practitioners within the industry.